Supply Chain as a Service (SCaaS) refers to outsourcing of supply chain management functions to a service provider. The services provided thus include, warehouse management, logistics management, order management, and other functions including supplier and vendor management. Significant growth of the retail industry is driven by proliferation of mobile devices and internet penetration in emerging economies are the major factors driving the growth of the North America supply chain as a service (SCaaS) market. In addition, rise in consumer expectations is also expected to fuel the market growth. However, security concerns pertaining to enterprise critical information among end users is the major factor that impedes the North America SCaaS market growth. Furthermore, integration of blockchain technology and omni-channel supply chain approach are expected to provide lucrative opportunities for the growth of the North America supply chain as a service (SCaaS) market. The North America supply chain as a service market size was valued at $4,478.20 million in 2017 and is projected to reach $7,854.40 million by 2025, growing at a CAGR of 7.5% from 2018 to 2025. The solutions segment dominated the North America SCaaS Market Share in 2017 and is expected to maintain this trend during the forecast period, due to increase in need to create efficient transportation of goods in various industries. Moreover, increase in competition in retail industries due to emergence of e-commerce platforms is also expected to create major opportunities for the supply chain solution providers. The logistics management segment dominated the overall North America SCaaS Market Share market share in 2017 and is expected to remain dominant during the forecast period, due to increase in need of improving customer service along with reduction in overall expenses of the company. On the contrary, the order management segment is also expected to grow at a rapid pace throughout the forecast years. U.S. was a major contributor to the growth of the North America supply chain as a service (SCaaS) industry. The dominance of this country is primarily due to the presence of major market players in this region. In addition, factors such as expansion and ongoing developments in retail, manufacturing, transportation, and other industrial sectors, are fueling the supply chain as a service market growth in the U.S. However, Canada has grown significantly in the last few years and is expected to attain the highest CAGR during the forecast period owing to rise in imports and exports with the U.S. The report focuses on the growth prospects, restraints, and trends of the North America supply chain as a service (SCaaS) market analysis. The study provides Porters five forces analysis to understand the impact of various factors such as bargaining power of suppliers, competitive intensity of competitors, threat of new entrants, threat of substitutes, and bargaining power of buyers on the North America supply chain as a service (SCaaS) market. The North America supply chain as a service (SCaaS) market is segmented based on component, application, organization size, industry verticals, and country. Based on component, the North America SCaaS Market is bifurcated into solutions and services. In terms of application, the market is classified into order management, warehouse management, logistics management, and others. As per organization size, the market is categorized into large enterprises, and small & medium enterprises. Based on industry verticals, the m North America SCaaS Market is divided into retail & e-commerce, healthcare & life sciences, manufacturing, energy & utilities, IT & telecom, government & defense, and others. On the basis of country, the market is analyzed across the U.S., and Canada. The North America supply chain as a service (SCaaS) market is dominated by the key players such as Accenture, CEVA Logistics, DHL International GmbH (Deutsche Post DHL Group), FedEx Corporation, GEODIS (SNCF Mobilits Group), Kuehne+Nagel, TATA Consultancy Services Limited, United Parcel Service (UPS), XPO Logistics, Inc., Zensar Technologies Ltd., and others. Current and future North America supply chain as a service market trends are outlined to determine the overall attractiveness of the market. 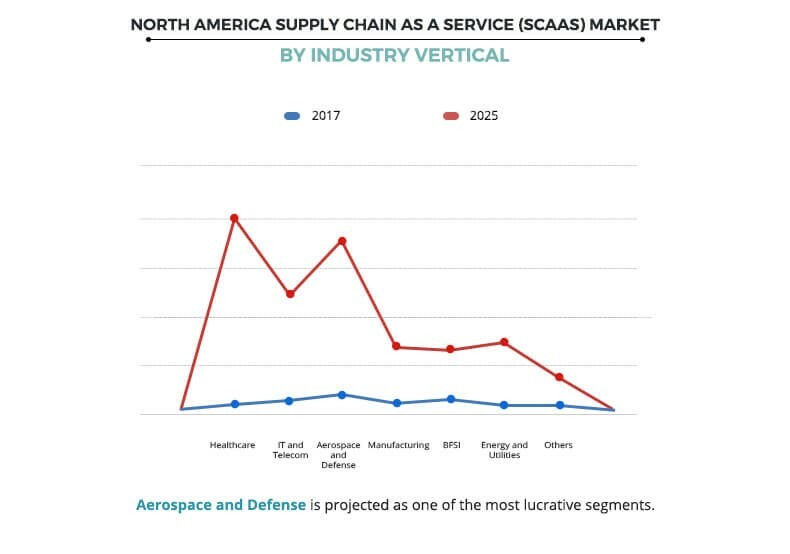 Top impacting factors highlight North America supply chain as a service (SCaaS) market opportunity during the forecast period. Factors such as growth of the retail industry and increase in requirement for managing logistics services, are expected to fuel the supply chain as a service (SCaaS) market demand. 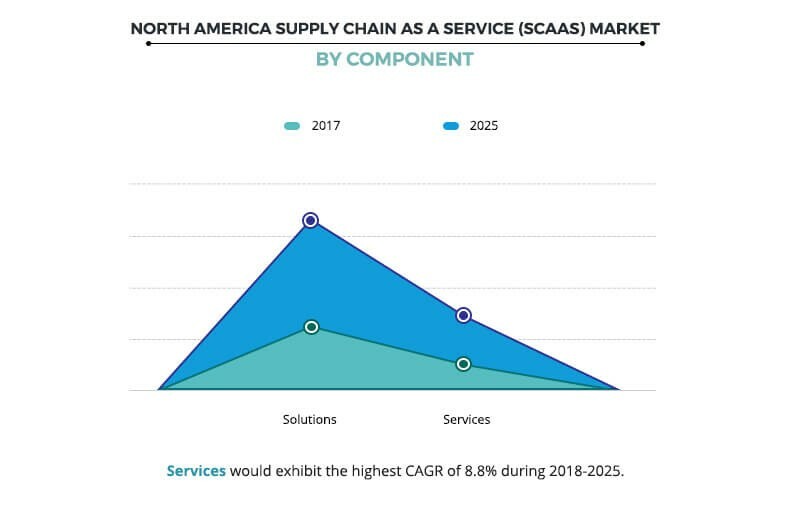 In addition, significant rise in customer expectations in the past few years is also a major factor driving the North America supply chain as a service (SCaaS) market. However, concerns pertaining to data security are expected to impede the market growth. Furthermore, integration of blockchain technology and adoption of omni-channel supply chain approach are expected to provide major growth opportunities for the North America supply chain as a service (SCaaS) market. Currently the retail industry is emerging at a rapid pace in the global marketplace, which is streamlining processes between producers, creators, manufacturers, online & offline shopping platforms, and consumers. The process thus involves the management of continuous supply of products, warehousing, inbound & outbound transportation, distribution, and others. Supply chain as a service thus plays a crucial role in streamlining all complex processes in the retail industry, which majorly drives the North America supply chain as a service market size. According to a U.S. Census report, the U.S. retail industry generated $1.14 trillion in 2017 that was 5.9% of the U.S GDP, which indicates the expansion of the retail industry in this region. Moreover, increase in globalization, rise in number of distributors, and growth in use of value-added supply chain services among retail industries are the major factors that propel the growth of the North America supply chain as a service (SCaaS) market. In addition, rise in need of strategic planning and better visibility of inventory that allow retailers to allocate stocks and meet the customer demand are expected to fuel the supply chain services. This in turn drives the growth of the market. When it comes to the order fulfillment, the expectations of consumers rise significantly, as consumers want to have their products/orders in hand as soon as they pay for it. In addition, with the advent of e-commerce platforms, the consumers can manage and compare their products and orders, and even return them once received. Such factors put tremendous burden on companies to satisfy the expectations of the consumers to deliver superlative logistics performance, which thus generates the need for outsourcing such services to supply chain as a service provider. Furthermore, supply chain as a service provider also reshapes buyer expectations by making efficient logistics imperative to stay competitive in the market. The growth in digitization of freight transportation within supply chain is opening several new ways for the supply chain as a service provider. New technologies and data streams such as blockchain are expected to enable different systems to operate in integrated, single, and trusted chain, which is anticipated to provide major opportunities for the market growth in the forthcoming years. Moreover, increase in data flow through all the supply chain processes facilitates the adoption of supply chain as a service. This is anticipated to be advantageous for the blockchain technology. Also, the blockchain technology is expected to help connect everyone involved in supply chain, which is expected to boost the market growth in the coming years. In addition, according to the Blockchain in Transport Alliance (BiTA), a member-driven organization, blockchain is expected support in connecting many systems and partners in the supply chain, which is anticipated to provide major opportunities for the market growth in the upcoming years. Furthermore, truck manufacturers deploy sensors, smart telematics, and software in their vehicles. This facilitates them to become carriers apart from being supply chain as a service provider, thus handling all the processes. Such blockchain opportunities are thus expected to improve the end-to-end management of moving freight in an effective way. This study presents the analytical depiction of the North America supply chain as a service (SCaaS) market trends and future estimations to determine the imminent investment pockets. A detailed North America Supply Chain as a Service (SCaaS) market analysis of the segments measures the potential of the market. These segments outline the favorable conditions for the North America Supply Chain as a Service Market Forecast. The current North America SCaaS Market is quantitatively analyzed from 2018 to 2025 to highlight the financial competency of the industry. Porters five forces analysis illustrates the potency of buyers & suppliers in the industry. Supply Chain as a Service (SCaaS) refers to outsourcing of supply chain management functions to a service provider. This allows an enterprise to focus on its core compatibilities. The SCaaS providers customize the supply chain management for an enterprise to efficiently deliver the services. The SCaaS providers can help both the major enterprises and small & medium enterprises streamline their supply chain networks. 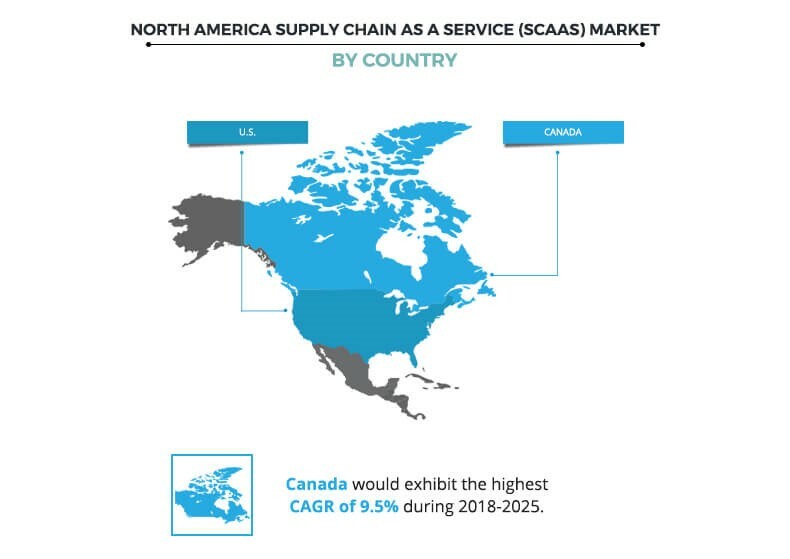 Furthermore, omni channel supply approach and integration of blockchain technology in supply chain services are generating major opportunities for the North America Supply Chain as a Service (SCaaS) market, which is expected to increase its demand during the forecast period. Moreover, many retailers have started outsourcing their supply chain management to supply chain as a service providers, which in turn boosts the market growth. As, increase in need to streamline the supply chain management due to complex processes involved in manufacturing, supply and transportation of goods fuels the market growth. For instance, according to a U.S. Census report, the U.S. retail industry generated $1.14 trillion in 2017, which was 5.9% of the U.S GDP. This indicates the expansion of retail industry in this region. In addition, rise in need of strategic planning and better visibility of inventory that allows retailers to allocate stocks and meet the customer's needs are expected to fuel the demand for supply chain as a services. The North America supply chain as a service (SCaaS) market is dominated by the key players such as Accenture, CEVA Logistics, DHL International GmbH (Deutsche Post DHL Group), FedEx Corporation, GEODIS (SNCF Mobilités Group), Kuehne+Nagel, TATA Consultancy Services Limited, United Parcel Service (UPS), XPO Logistics, Inc., Zensar Technologies Ltd., and others. The key players have adopted various growth strategies to enhance and develop their product portfolio, strengthen their supply chain as a service (SCaaS) market share, and to increase their market penetration. For instance, in November 2018, Accenture acquired Intrigo Systems to expand its capabilities in digital supply chains. Furthermore, United Parcel Service (UPS) expanded its supply chain solutions business in Louisville to increase its portfolio and service. In addition, it is expected to allow users to lease space for warehousing, cold storage, and other services at UPS facilities. "North America Supply Chain As A Service "